I recently finished reading “Oogy: The Dog Only a Family Could Love” by Laurence M. Levin about a dog who was probably victimized as bait in a dog fighting ring. It was a great story (with a happy ending), and Oogy is a terrific dog now living with a wonderful, loving family. The sad part is that dogs like Oogy are everywhere. I have volunteered at the Cape May County Animal Shelter in Cape May Court House, N.J., for the past six years. We tend to get a lot of pit bulls into our shelter. 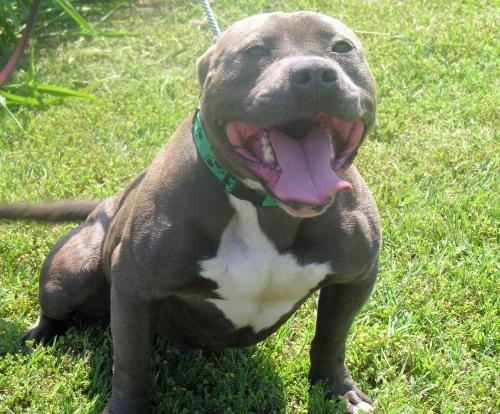 People get turned off when they see all the pits on Petfinder or in person when they come in. We have four adoptathons at PetSmart each year, and our director started a once a month meet and greet on the first Saturday of each month. More and more we are bringing pit bulls to these events, and people are amazed at how beautiful they are, how affectionate and how they are great family dogs. So many of the pits absolutely love kids. 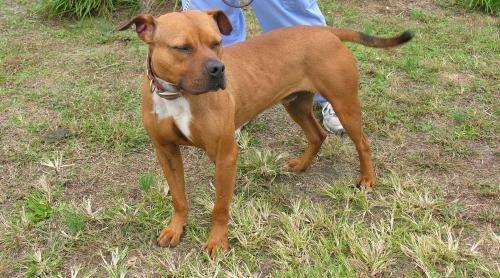 Tiki (above) is a small, muscular brown pit bull who came in with puncture wounds all over his body. He walks with a stiff gait and holds his head at an angle. We are certain he has neurological damage from his ordeal, but Tiki survived. He is a love bug who gets very excited to go for walks and to get attention and treats. He rolls on his back and just wiggles all over the ground. He is so loving and happy. He was an angel at PetSmart, greeting everyone and just having the time of his life. Dogs are so forgiving. He could have turned mean or become afraid of people, but he just wants to love and be loved. He is still waiting for his forever home. Frankie is a blue pit who had his ears razored off. He looked fierce at first, but once we got used to him, all we could think of was a pot-bellied pig. Frankie waddled and snorted when we walked him. He was a little tank of a dog – all muscle, but with a soft heart. He too just wanted attention and to be loved. He made us laugh. He loved going for walks and would strut around the shelter grounds like he owned the place. The great news is that Frankie was adopted a few weeks ago by a family with a 2-year-old and 6-month-old. Frankie sensed he had to be gentle around the little boy, and he is doing so well. The dad is thrilled with him and how smart and well-behaved he is. All it takes is an open mind and some education about pit bulls. They are wonderful, loving, family dogs that are loyal and gentle. My husband and I have six rescued dogs – three are pits. They all get along, and they have made wonderful pets. 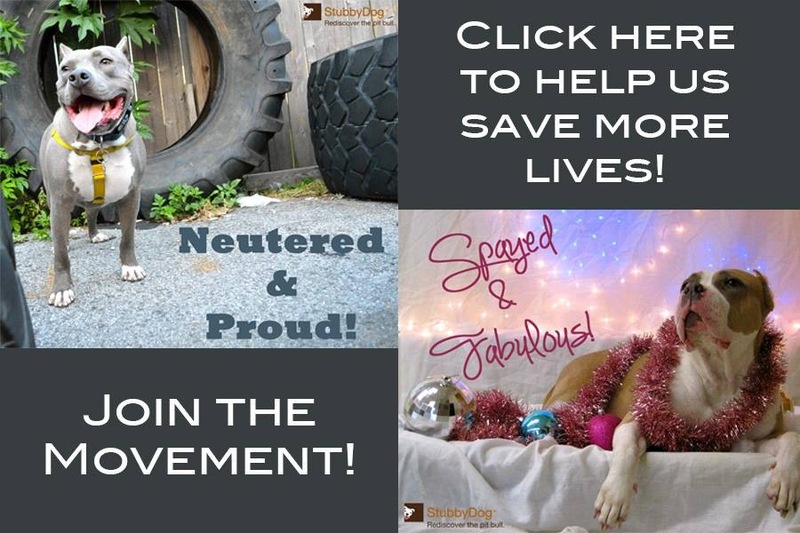 My message to the world is to please consider giving a pit bull a loving home. They deserve it. YAY Frankie!! WOOF WOOF two paws in the air doing zoomies!! Pitties are t he best dogs ever in my opinion. Grew up with a Germany Shepherd who was very intelligent and loyal and I thought when I became an adult that would be the breed for my family. Well long story short I still have love for Toby however, a new love has come into our lives and all is well!